The Saturday run will, as usual, cater for the distances 5km, 7.5km and 12km. The group decided that it is time for a lakeside run and our 12km run will take us all the way around West Lake along this route. The pace will be adjusted to whoever participates, so join! Meet at Sedona Suites entrance, To Ngoc Van street, Tay Ho. The group doing intervals continues to meet and “enjoy” the sensation of a galloping pulse. We still do 45 minutes and the total distance covered is only 5.6km and there are plenty of breakes – so everybody can join! Meet at Sedona Suites entrance, To Ngoc Van street, Tay Ho. If you missed last weekend’s sign-up event and you still want to register in person, come and see us at JOMA BAKERY CAFE on To Ngoc Van street, Tay on Friday November 25th between 5.30pm and 8.30pm. You can still register online too! 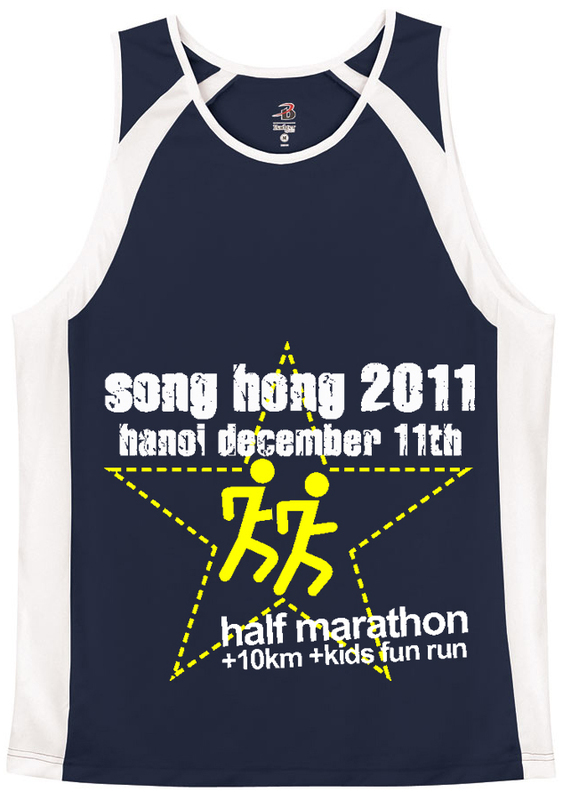 Here’s a sneak preview of our Song Hong 2011 shirts – advanced orders for shirts has now closed, but we will have some available for sale on race day. Really looking forward to the run on Saturday. The weather is suppose to be beautiful, 25 degrees and sunny. I was just wondering is there somewhere we can leave a bag at the start/finish of the run? People always seem to manage to leave a small bag somewhere – at the parking guards or at the Mini Market ( if you also buy a little something 🙂 ). So if it’s not full of valuables it should be just fine.